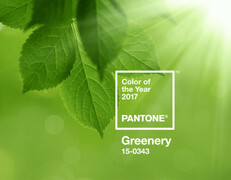 Pantone, an X-Rite company and the global authority on colour and provider of professional colour standards for the design industries, today announced PANTONE 15-0343 Greenery as the PANTONE® Colour of the Year selection for 2017; a fresh and zesty yellow-green shade that evokes the first days of spring when nature’s greens revive, restore and renew. Illustrative of flourishing foliage and the lushness of the great outdoors, the fortifying attributes of Greenery signals individuals to take a deep breath, oxygenate and reinvigorate. The more submerged people are in their own modern realities, the greater their innate craving to immerse themselves in the physical beauty and inherent unity of the natural world. This shift is reflected by the proliferation of all things expressive of Greenery in daily lives through urban planning, architecture, lifestyle and design choices globally. A constant on the periphery, Greenery is now being pulled to the forefront - it is an omnipresent hue around the world. 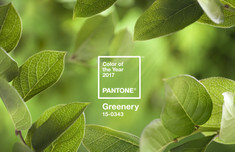 PANTONE 15-0343 Greenery, a life-affirming shade, is also emblematic of the pursuit of personal passions and vitality. In this spirit of reconnection, exploration and belonging, Pantone has partnered with Airbnb - a community marketplace that provides access to unique accommodations and experiences around the globe - to bring Greenery to life through an experience in early 2017. The collaboration, a first of its kind, was inspired by Pantone’s vision for Greenery and Airbnb’s community that connects travelers to magical experiences. Greenery is nature’s neutral. A great harmonizer merging undertones of cool blues with vibrant yellows, the hue is a natural complement to a wide range of palettes. Like the spectrum of possibilities in colourful petals and blooms paired with lush green leaves, plants and trees, Greenery provides a pop of colour in accessories and footwear, or acts as a bold accent in a pattern. Prominent in fashion for men and women, as seen in the recent collections of Kenzo, Michael Kors, Zac Posen and Cynthia Rowley, Greenery has also been shown in a variety of solids and prints in children’s wear. Greenery blends fashion and tech as well, as a prominent colour for wearables and activewear. Open spaces in interior and exterior design and floor-to-ceiling windows allow the green outdoors to become part of a room’s backdrop and ambiance. Adding Greenery through living walls, terrariums, botanically-themed wallpaper, paint, accent furniture and decor provides respite and breathing space. A Greenery-painted wall or piece of furniture delivers a pop of colour, with the added benefit of creating the illusion of nature indoors. Bringing the outside in, the shade - like the plant life it represents - can improve self-esteem, reduce anxiety and heighten awareness of one’s surroundings. In the ultimate personal display of boldness and vitality, Greenery is deployed as a chic, confident punch of colour for hair, lips, eyes and nails. It is also a camouflaging base for natural beauty looks, with green makeup rooted in colour-correcting trends. A complementary colour to red shades, Greenery plays down ruddiness in the skin. Holistic, harmonious living is linked to the power of plants: Invigorating Greenery is prominent in many health food trends today, including matcha, seaweed and avocado, while the growth of urban agriculture and indoor vertical farms brings the essence of Greenery to unexpected places. On the table, Greenery plates and chargers provide an appetizing backdrop for food – making dishes pop and appear fresh. Greenery is also often used in design for the hospitality and culinary industries to convey organic healthfulness. Because of green’s prevalence in nature, it maintains a perception of being inherently good for you and organic. People respond on a visceral level to the hue, making the eye-catching Greenery an ideal shade for many applications of graphic design. This is especially true for packaging, where the sight of Greenery provides an instant message of freshness. The colour selected as our Pantone Colour of the Year 2017 was taken from the PANTONE Fashion, Home + Interiors Color System, the most widely used and recognized colour standards system for fashion, textile, home and interior design. For more information on the PANTONE Colour of the Year for 2017, please visit www.store.pantone.com/uk/en/color-of-the-year-2017.